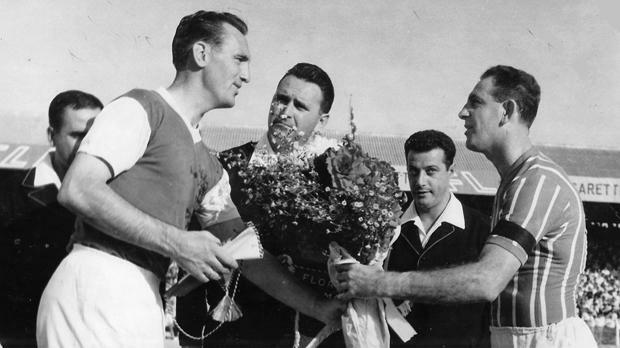 Floriana captain Pullu Demanuele (right) exchanging tokens and flowers with his Ipswich Town counterpart at the Gzira Stadium on September 18, 1962. When in 1961-62, Hibernians and Floriana took part for the first time in the European Champions Cup and the Cup Winners’ Cup there were conflicting views in Malta. Many reasoned our clubs were too small to compete with the giants of Europe. Others, were more optimistic and argued that the only way to improve was to participate and gain experience from clubs of a higher standard. In time, both factions were proved to be correct. During the first years of Malta’s participation in Europe, our clubs were often humiliated with big scores but as we gained experience better results were obtained and at times we even managed to upset the applecart and score unexpected good results. In season 1962-63 Malta was once again represented in Europe by Floriana and Hibernians. This time their roles were reversed. Floriana played in the Champions Cup and Hibernians in the Cup Winners’ Cup. The luck of the draw brought Floriana against Ipswich Town, of England, while Hibernians were paired with Atletico Madrid, of Spain. Originally Hibernians were drawn to meet Olympiakos but the Greek side retired from the competition and the Paolites progressed to the next round. Financially both ties were a great success but on the field of play our teams had mixed fortunes. Ipswich were not a big name in Europe. In fact, a couple of years earlier they were still an unfashionable team in the Third Division. Then, they went through a great transformation and a bewildering run of success took them to the very heights of the English League. The fact that the English champions were an unknown quantity built up hopes of a satisfactory result for Floriana. A huge crowd filled every nook and corner of the stadium but they all went home disappointed. Floriana were swept off their feet by the terrible attacking force of England internationals Ted Philips and Ray Crawford. Ipswich played a cautious game but in the end they emerged winners by four goals to one. One shudders to think what the outcome would have been had they gone all out for victory. Crawford and Philips scored two each for the visitors while Pullu Demanuele scored a consolation goal for the Greens. A few years later, Philips came to Malta to play for Sliema Wanderers but instead signed for Floriana in one of the most controversial deals in the history of Maltese football transfers. The return match at Portman Road was a personal triumph for Crawford who scored five goals in a comfortable 10-0 victory. To their credit, Floriana tried to make a game of it but they could never keep pace with their opponents. It was a sharp pill to swallow but, at least, the experience served as an eye-opener. In future, more preparation was required to avoid similar embarrassing results. With reference to last week’s article, entitled ‘The great amateur era’, the name of one of the Floriana Tigers FC players indicated in the accompanying picture is Francesco Chetcuti not Fredu Chetcuti as inadvertently published.